Don’t Miss the Orionid Meteor Shower! 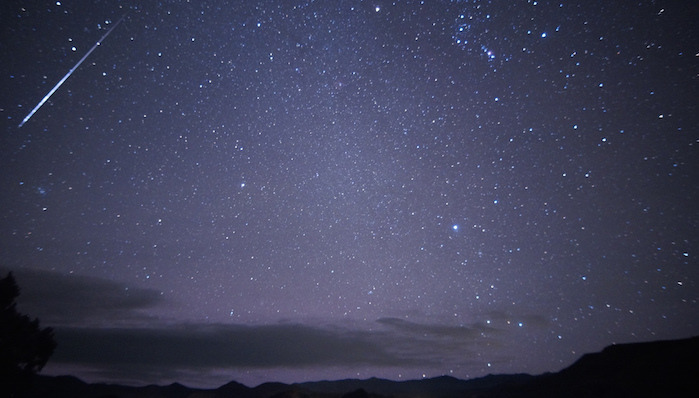 Home » Astronomy » Don’t Miss the Orionid Meteor Shower! Photo of the 2012 Orionid meteor shower by Mike Lewinski via Flickr (CC 2.0). Halley’s Comet is only visible from Earth once every 75 years, but residual chunks from its tail generate two annual meteor showers: the Eta Aquarids in May and the Orionids in October. The Orionid meteor shower is meteors formed from the debris of Halley’s comet. This meteor shower takes place in October and November each year. It’s called Orionids because the meteors seem to emerge or radiate from the shoulder of the constellation Orion the Hunter, one of winter’s most prominent constellations. Although the meteors emerge from a single point, they can appear anytime and anywhere in the night sky. When can I see the meteor shower? Meteor showers aren’t just one-night events, but there’s typically a best time to watch. Nobody is sure EXACTLY when this will be, but according to EarthSky.org, the best time to see the Orionids this year will be in the early morning hours, after midnight and before dawn, on Thursday, Oct. 20 or Friday, Oct. 21. This is when it is forecasted that Earth will encounter the densest part of the debris stream, with the most meteors streaking across the sky. This year is a modest meteor shower so at its peak, you’ll be able to see up to 10-20 meteors every hour. The best way to watch is to wake up one or two hours before sunrise, and look up towards the constellation Orion. Prepare to wait: Bring something to sit or lie down on. Stargazing is a waiting game, so get comfortable and be prepared to relax and enjoy the event!